All the Beautiful Fairy Nursery Theme Ideas, Decor and Bedding You Need to Create the Perfect Fairy Fantasy Land for Your Baby Girl! Take off on gossamer wings through the enchanting, magical world of fairies and fairy gardens. From fairy circles and toadstools to fairy castles in the sky, there are lots of different ways to turn your nursery into a room full of fairy dust that any little girl would fall in love with. 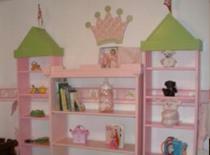 You'll also find a world of charming ideas in the wide range of fairy baby room decor available on the market. From whimsical wall art to fairy figurines, you'll find everything you need to decorate your fairy nursery at our Fairy Nursery Decor Store. Or visit the Fairies theme section at ababy.com. You'll find a captivating selection of mix and match fairy theme decor all in one place. Furniture, bedding, lighting, rugs and more. Everything you need to create a fairy fantasy land. Click here to go to the ababy.com fairy theme section. 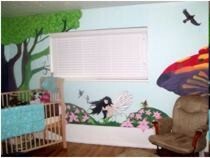 If you are decorating a fairy theme nursery enter it in our baby nursery photos contest here. You could win a great prize and we will add your nursery to this page to inspire other moms! White with touches of lilac and pink for a vintage theme. Pastel blue, green and white with splashes of pink and lavender for a spring fairy woodlands theme. How about adding slightly bolder colors and splashes of yellow for fairies frolicking in a summer garden theme? 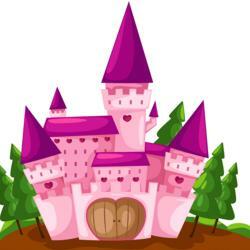 Pinks, lilacs and robin's egg blues for a fairy castle in the sky. Try hot pink, white and a touch of black for a more modern approach. Try cutting poster board into strips and painting it glossy white to create a picket fence or a lattice work around the bottom of your nursery walls. Clouds can be painted by watering down white pva paint and sponging it on in circular motions. If you decide on a vintage fairy theme, vintage fairytale posters in silver frames make perfect nursery wall art. Add some porcelain fairy figurines or Beatrix Potter woodland characters, an antique dolls house and old, classic fairy tale books. If you want to go for a cartoon type fairy theme, you can't go wrong with Peter Pan and Tinkerbell. Add touches of glitter around Tinkerbell's wings and scattered from her fingertips to make fairy dust. Paint a beautiful fairy castle in the sky and surround it with cotton wool clouds. Paint your baby's name between the towers. Mimic the cloud canopy by hanging sheer, flimsy, white fabric above the crib and over the windows. For a fairy garden nursery don't forget to include a bird bath, picket fence, flowers and lots of winged creatures like butterflies and dragonflies - hang them from the ceiling on varying lengths of transparent twine to create a 3-dimensional feel. A fairy woodland theme must include toadstools and fairy rings. It's fun to combine this theme with gnomes, trolls and Beatrix Potter's woodland characters. 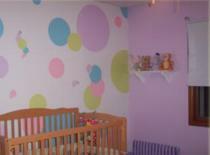 Paint or stick a tree on the main nursery wall. Add windows and hang paper lanterns from the branches for the fairies and woodland creatures that make their homes there. You could even wind fairy lights through the branches. Or spin it a different way and create a snowy fairy wonderland filled with snow fairies in furry mufflers and fur-lined wings. Add a few children's fairytale books to your baby's bookshelf. You can spend many delightful hours reading them together as your child grows.